If you haven’t caught the theme around TNW apps, we have a certain love for minimalism. It was no wonder, then, that we fell in love with a drag & drop photo sharing application called Minus. While we did have some gripes about it, most of them were fairly small and have already been dealt with since we wrote our first piece. One glaring omission, in our opinion, was a way to access Min.us away from the site itself. However, it appears that another gripe has been answered because the Minus Extras have just been released. WIth a desktop application you’ll be able to drag and drop files to a Minus icon and they’ll be swooped off to the site. Upload progress is monitored and it even has support for notifications. You can get the Minus desktop app for Windows, OS X and even Linux, so you will have to try hard to have an excuse. There’s also an Android app that will allow you to upload directly from your Android Share menu. Word has it that the iPhone and Blackberry support is, of course, “coming soon”. Minus tops off the trio with Minus for Chrome. I’ve been using it for a couple of weeks and I absolutely love it. The clean, standard interface of Minus is built right into your Chrome Web Apps page. While it is, predictably, just a shortcut to the Minus site, it’s very handy to have the “app” at your fingertips. Give them a run and let us know what you think. 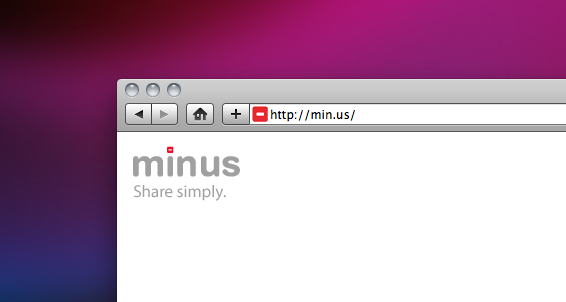 When Minus says “share simply” that’s exactly what it means.